On April the 16th Falkirk&Callander Taekwondo club had the great honour of training with 2 famous Grandmasters, Grandmaster Park Hae Man 10th Dan and Grandmaster TK Loh 10th Dan visited our club and ran a patterns seminar. 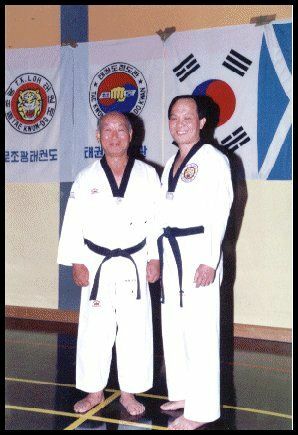 Grandmaster Park was one of the early pioneers of Taekwondo starting his Taekwondo career in 1945, he was one of the Original Masters who created the early poomsae’s which are still in use today though they have been updated since then. The seminar started with the old scottish tradition of our guests being piped into the event by one of our young students. Grandmaster Park then commenced the seminar with a warm up, he then covered all the Taeguk patterns and Black Belt patterns stopping at relevant points to explain the movements and the reason for the way the movements are to be performed. All students who attended learned about their patterns and the purpose of the movement, I am sure that everyone left the seminar with more knowledge and inspiration from such a great modest man. We ended the day by presenting Grandmaster Park with a traditional Scottish Quaich to remember the event. Photo’s are now on our website for viewing. A big thanks to Grandmaster Loh and Grandmaster Park for making it such a memorable day.